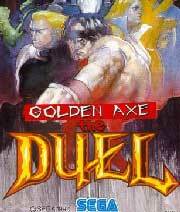 If you were ever hoping that Golden Axe would transform itself from a side-scrolling adventure into a Street Fighter-like fighter, than the Duel was a dream come true. Originally appearing in the arcades, The Duel quickly made a new appearance on the short-lived Sega Saturn in 1995. Kain Blade -- An orphan raised by a legendary warrior. Any relation to Sternblade? Maybe Ax-Battler? Who knows for sure? Milan Flare -- A princess of the kingdom of Winwood and a descendant of Tyris Flare. We are only left to wonder who the father is. My money is on Ax-Battler. Gilius Rockhead -- The great-grandson of Gilius Thunderhead. Zoma -- A former advisor to the king of the evil land of Lustan. Doc -- A healer from the island of Miribar. Keel -- An elf warrior from the northern province of Crystal. Jamm -- A girl raised by animals and protected by a wilderness spirit. Panchos -- A big fat guy who's fond of bombs. Green -- Lone survivor of a race of half-human, half-plant giants. Golden Axe the Duel was met with little excitement. Both home and arcade users found themselves deluged with other games, including new versions of Street Fighter, Virtua Fighter, and Mortal Combat. The lack of attack "combos" like those found in other games turned off even those who indulged in the genre. By this point, the market had seen the side-scrolling hack-n-slash go by the wayside. Golden Axe, Teenage Mutant Ninja Turtles, The X-Men, and even the Simpson's all dipped their hand into the genre. The world now focused on first-person shooters, and combo-based fighting games. Has the golden age of Golden Axe finally slipped into the past? Will a resurgence of allied game-play one day resurrect Golden Axe from its ashes? We will have to wait and see.